Aboriginal mothers are younger and rarely give birth in private hospitals. Their babies are likely to be born prematurely and have low birth weight. Factor by which the number of babies of Aboriginal mothers are more likely to be of low birth weight (less than 2,500 grams) compared to those of non-Aboriginal mothers. 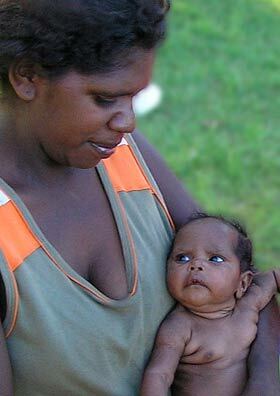 Average birth weight of babies in 2009 born to Aboriginal mothers; of those born to non-Aboriginal mothers: 3.37 kg . Times higher: The likelihood that Aboriginal babies have renal problems, compared to other babies . Times higher: The probability that Aboriginal mothers die in childbirth, compared to non-Aboriginal mothers; factor for their babies: 2..3 times . Factor by which Aboriginal women are more likely to give premature birth than other Australian mothers . Factor by which the risk of Sudden Infant Death Syndrome (SIDS) for Aboriginal babies is greater than for non-Indigenous babies . SIDS declined steadily since 1980 for non-Aboriginal mothers, but remained the same for Aboriginal mothers . Number of Aboriginal midwives registered in Australia . Registered nurses and midwives in Australia more than 331,000 . Percentage of Aboriginal children who are breastfed at 6 months; same figure for non-Aboriginal kids: 16% . The foetal death rate of Aboriginal babies declined from 1.6% in 1991 to 1.1% in 2004. But the rate was still still double that of non-Aboriginal mothers. Infant mortality declined by 62% from 1991 to 2010 . Babies born to Aboriginal mothers were twice as likely to be born prematurely as those to non-Aboriginal mothers. 13% of babies born to Indigenous women were of low birth weight. Only 6% of non-Aboriginal babies were of low birth weight. Low birth weight is a key indicator of health status. On average, Aboriginal mothers were 24.8 years old which is younger than non-Aboriginal women. Numbers of Aboriginal teenage mothers decreased from 10% in 1991 to 8% in 2004. Only 3% of Aboriginal mothers gave birth in private hospitals, compared to 32% of non-Aboriginal mothers. Aboriginal mothers are 3 times more likely to have smoked during pregnancy as non-Aboriginal mothers. In 2011, 51.2% of women smoked, 14.8% drank alcohol and 15.9% used illicit drugs . Immunisation: In 2016/17, about 92% of Aboriginal children aged 1 year were fully immunised, 89% of children aged 2 years and 96% of children aged 5 years. Children in remote areas are over 2 times more likely to be immunised that those in cities . In the 1950/60s at the Echuca Hospital, Victoria, Aboriginal women in labour were placed on the veranda to give birth, not inside the wards . Adding folic acid (a B vitamin) to bread leads to 68% drop in serious birth defects among Aboriginal children . In 2016, 96% of non-Aboriginal mothers began breastfeeding at birth and 16% were still exclusively breastfeeding when their child was 6 months old, the period recommended by the World Health Organization. The following video is the result of a community project with the Western Arrarnta people of Ntaria (Hermannsburg, NT) whose women wanted to reinforce the benefits of breastfeeding and educate their community and other Aboriginal people about the importance of breastfeeding. "Breast is best." The New Directions: Mothers and Babies Services (NDMB) program, run by the Department of Health, but delivered mainly by Aboriginal community controlled health organisations, has helped improve the health of Aboriginal mothers and their children in "all areas" . The program aims to increase access to child and maternal health care for Aboriginal families from antenatal care to immunisation and health and health checks for children before starting school. Lisa Briggs, CEO of the National Aboriginal Community Controlled Health Organisation, is enthusiastic about the program. “It’s working. Mothers are seeking antenatal care earlier, recording higher birth weights, and getting better outcomes on health assessments for both children and their mothers," she said. The number of children under four years taking health assessments has doubled. In 2014 it was working so well that people had to be turned away . In 2006 Dr Helen Milroy of the Palyku people of Pilbara, Western Australia, was Australia's only Aboriginal psychiatrist. Her research found 24% of Aboriginal children aged 14-17 were at high risk of clinically significant emotional or behavioural difficulties compared with 15% in the non-Aboriginal population . Children exposed to high stress events such as illness, family break-up, arrests or financial difficulties are most likely to be in this group. More than 1 in 5 children lived in families where there had been seven or more such high stress events in the preceding 12 months. About 12% of these children were being looked after by a parent who had been forcibly removed from their natural family (Stolen Generations). 33% of these children were in the care of a sole parent. Many experts agree that culture and a sense of belonging are vital for an Aboriginal child's welfare and well-being . Culturally appropriate childhood services are best to keep Aboriginal children connected to their community and culture. But only 4% of Aboriginal communities in the NT have access to childcare . Statistics show that more than 37% of children in state care in Queensland are Aboriginal while just 7% of people aged under 17 years are Aboriginal in that state . Experts say that the major causes are "poverty, poor housing, poor health care, poor educational and employment opportunities" . These factors are also more significant than race when child protection systems determine if children should be taken into care. It is routine practice in all remote Northern Territory Aboriginal communities to transfer pregnant women into regional centres to wait for labour and give birth in hospital . They are often treated by medical staff without specialised knowledge of maternity care . The cultural needs of Aboriginal women are very different to other women. Research suggests that birthing on country is better as it strengthens Aboriginal women's business and supports their cultural obligations. Many Aboriginal women distrust the mainstream hospital system because they have a fear of prejudice and of being judged so they choose not to go . Many hospitals have an Aboriginal liaison person but sometimes this person is a man, who can’t be involved in women’s business. A close relationship with a midwife helps reduce Aboriginal peri-natal mortality which is "well above the average" . "Traditionally Aboriginal women gave birth on country with other women around them, and there are important ceremonies that take place outside on country that welcome the child into the world," says Aboriginal midwife student Tanya Bonner . "Now, in isolated communities the women are flown to a regional hospital at 36 weeks into their pregnancy and have to stay in accommodation in town without their extended family until they give birth in the nearby hospital. "The women feel they have no choice, and if babies aren’t born on country they lose some of their link to the land." Traditional birthing practices could also be invigorated if women gave birth where they live.